The following issue of TFZ magazine includes our pursuit in understanding traditional synagogue worship as well as its establishment. It deals with the complicated, yet inseparable relationship between the synagogue and its younger sister – the early church. 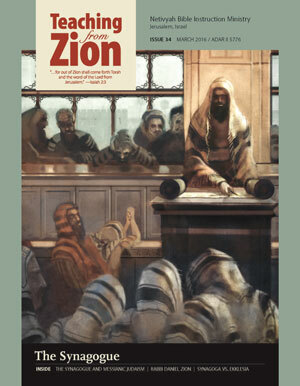 Several articles in this magazine describe and articulate the role of the synagogue within the context of the modern messianic movement. Likewise, it discusses the road that we have all taken in pursuit of the origins of Jewish worship and lifestyle. Also, current messianic congregations that can be an authentic synagogue as well as genuinely messianic, can serve in bridging the gap between Jews and Christians. In turn, it can aid in finding a common path of return to our true faith and shared heritage. This is the restoration of both groups into His will and goal for all mankind; as the church without a synagogue is only a shadow of itself. Our hopes and prayers are that God’s plan will be known and accomplished for both the church and the synagogue, because ultimately, we are one in the Messiah.